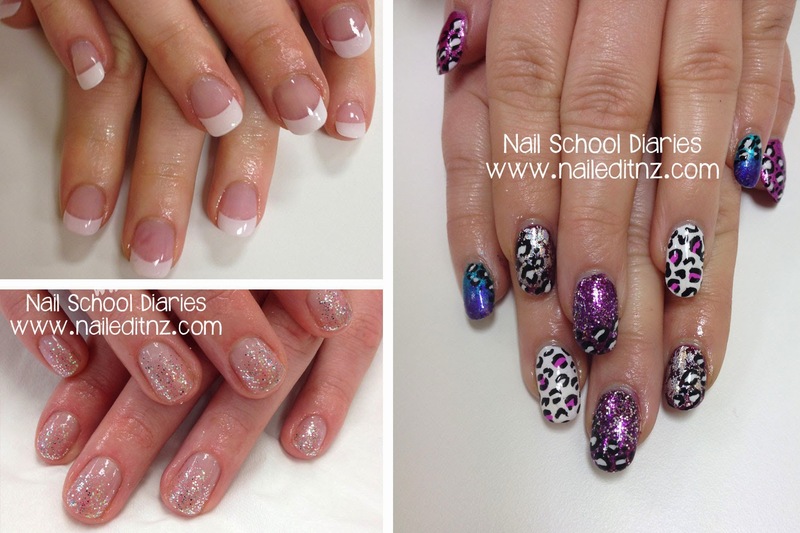 Another three weeks of nail school updates! It feels like it's been much longer than that since I last updated - we've been doing a LOT in that time. The biggest thing that I've been excited/stressed/frustrated about is that we've started sculpting! And wow, it is difficult. Much quicker and cheaper than tips once you've got the hang of it, and it's much better for people with bitten nails... but ugh it's just so tricky at this stage! Here are some pictures from the first day we played around with it. My friend Paigh (yes, with an 'H') and I used a Surmanti powder for the tips. So pretty and sparkly! This was my first "kind-of" set using sculpting. I only used forms on the thumbs, as my friend has very short thumb nails, but I did sculpt on the colour and smile line rather than using a tip. It was very challenging! My biggest issue with sculpting is the forms. THE FORMS. I swear they have a vendetta against me. I like the ones I have at home more - the course ones are too big for my liking and come unstuck easier, as you can see in the photos. Or maybe that's just my novice level shining through... don't judge me :P.
This was technically my first real set of sculpted acrylics... they were on my friend Shayla, and we created the colour used at the tips by mixing together polymer, pigment and glitters. It reminded us of bath bombs! We made one nail just plain and clear; we were going to add nail art to it but never quite managed to in the end. Also at this point I wasn't aware you had to sculpt the end to look pretty, and so I had to do a horrendous amount of filing! I think Andrea B (my teacher) was trying hard to hold back when she saw them! I did like the finished look though, and Andrea was impressed at my perseverance in filing them ☺. Only way is up, right? I struggled through both of the sculpted sets in the next picture, but I'm getting better. 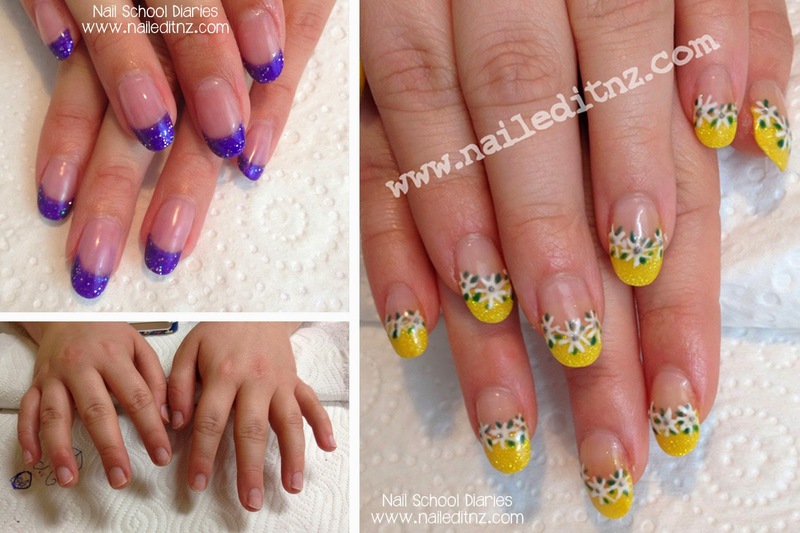 The yellow ones were done on a friend who has very sensitive hyponychiums, so she hated the forms and said they hurt. I felt so bad! I was rushing to finish her nails (I was being timed as well) and it was so incredibly stressful. I wasn't happy with the filing job I had done, so offered to finish it off properly at home, and add some nail art. As soon as we left the room I realised it was pouring with rain, so I had to run 500m to my car and got absolutely drenched. This is at 8pm at night, in winter; I hadn't had tea and still had a good hour of filing and nail art-ing to do. Thankfully, my brain decided that it was such a bad day that it was somehow GOOD. I ended up in quite a silly mood that night, and managed to fix up the filing on her nails and added the cute daisy design. Nail art is my happy place. We giggled incessantly at a funny shaped daisy and a couple of strange nail phrasings that you don't really hear in everyday life. Later that night I was still in that so-stressed-I've-gone-crazy mood and was hysterically laughing while re-telling a story about how I told the guy at the petrol station that we needed to over-run the banks (two words - pay wave). Tears were running down my face...Yeah, it was a strange day. The day after that (yesterday, at the time of writing this) I had a uni friend booked in at my home salon (almost open to the public now! I'm making appointments but haven't done an official announcement yet). We mixed up a purple with holographic and silver glitters in it - I loved the colour. I was pretty happy with the end result, but next time I certainly know what to do better. It also took absolutely ages! I'm not sure how it took so long, but I felt so bad because she hadn't eaten all day and was starving! On the upside I was using a new brand and I absolutely loved it. Found it easier to work with as it set a little slower than what we use at course, so it was really good for me. I also feel the need to point out that she had the most beautiful nails! 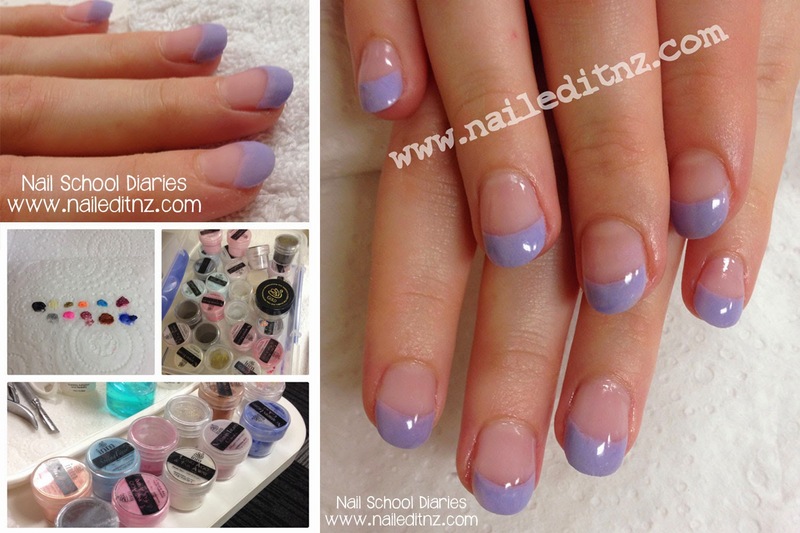 Such long, healthy nail beds - I have massive nail envy! Here are a few other things I've done over the last few weeks - a rebalance on a friend (that was unusually difficult), glittery gel polish on another friend and finally, acrylics with a crazy leopard-print graffiti design. Something I also loved doing recently was first aid. We've just finished our little course, and I will soon have my first aid certificate! I should add that I am awesome at giving CPR, so if any of my clients go unconscious around me they will be A-OK. Well, I'll be able to keep their blood moving, at least. We also played around with some paraffin wax last week and it was divine! 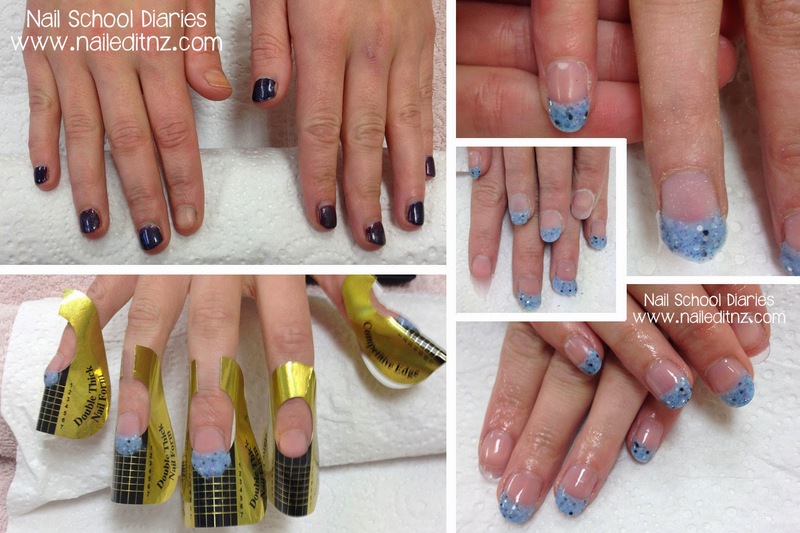 And so concludes the latest Nail School diaries update! I feel like I've turned a corner with sculpting. I know what I've been doing wrong, now I just need to concentrate on following the exact steps and getting my time down. Practise, practise, practise! I'm off to edit a tutorial now, and once that's uploaded I'm going to finish reading The Fault In Our Stars. Addicted, love it SO much! Hope you're having a good week, and let me know if you have any questions or comments about what I've been doing at nail school for the last few weeks. when you say rebalancing is that the same as a fill? like when the acrylic/gel grows out & you add some more to cover up the naked spot? or is it something else entirely? LOVE these updates!!! thank u soooo much 4 doin them!! Yup, like a re-fill. We call it rebalancing as we rebalance the whole nail - re-position the apex as well as filling in the back :). Great to read about your progress! 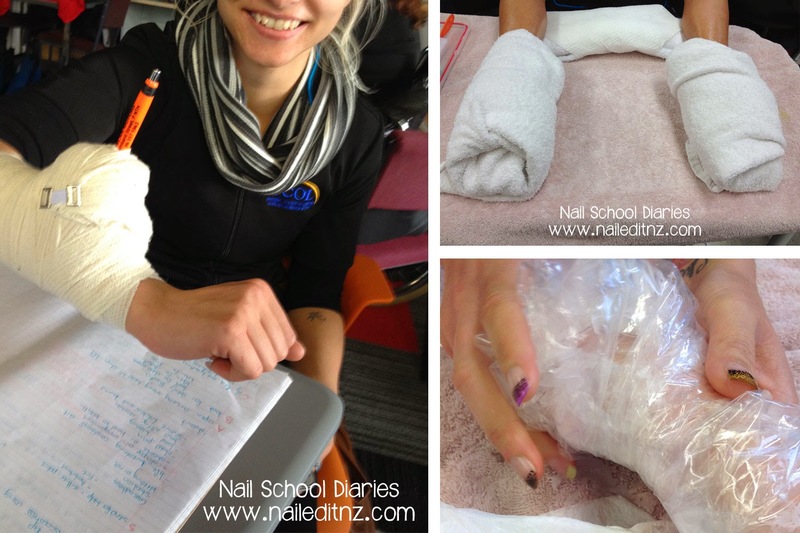 Jessie, I am also still really enjoying your nail school diary posts. Thank you so much for making them up for your readers!